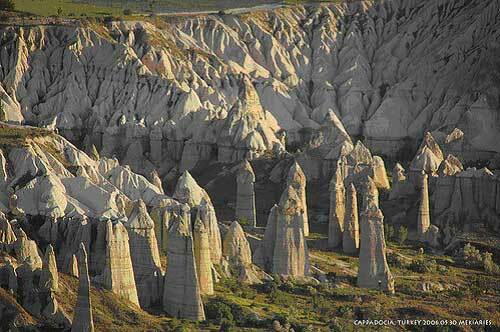 This region is famous for the odd formations of it's surreal landscape - weird spires and mushrooms, the result of the erosion of the soft volcanic rock which covers the area. 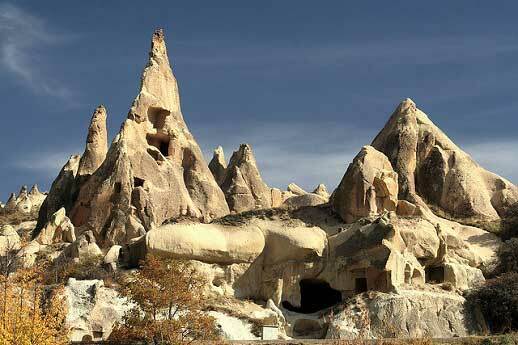 Troglodyte dwellings are common, with entire cities consisting of houses and churches carved from the rock. Fabulous, varied walking in season through different parts of this extraordinary area. The area has a fascinating history, particularly as a centre of early Christianity. Cappadocia is justly famous both for its extraordinary, unworldly scenery - deep canyons cut into the soft volcanic tuff and weird rock formations - and for its troglodyte homes and churches - deeply burrowed towns even - and early Christian history. It thoroughly deserves its World Heritage Site status. Cappadocia is beautiful (in a strange way), with its natural cones, pinnacles, ravines, canyons and cliffs varying in colour from warm and earthy ochres to cooler shades of green and grey. The area's canyons and trademark 'mushroom' formations (or fairy chimneys) were created through the erosion of the deep, soft, geologically young - a few million years old - compacted volcanic ash with a harder layer of lava above, and the 'chimneys' evoke fairytales or nightmares, depending on your state of mind (substance profile for the younger visitor). 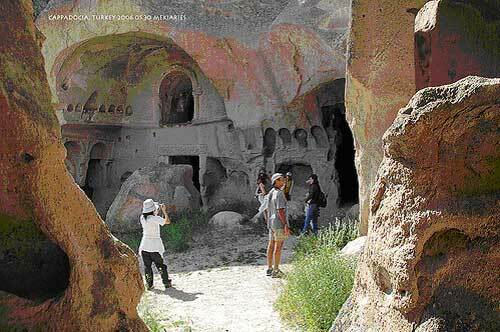 The locals have for centuries made use of the soft rock, and troglodyte dwellings burrow deep below the surface, even creating underground cities (which were often used by early Christians as hiding places), such as Kaymakli. The region's greatest man-made glories, though, are the churches and monasteries, often sporting the remains of rich wall-paintings and facades reminiscent of Petra, which are dug deep into the cliff-faces. Cappadocia was a centre of early Christianity, producing the 'Cappadocian Fathers' and John of Cappadocia, Patriarch of Constantinople between 517 and 520AD. There is no single famous trail here. Instead, there is a plethora of pedestrian pleasures to choose from. You must explore at least two of the extraordinary 'valleys' (for which generally read canyons) around Goreme: we suggest a physically weird one (i.e. 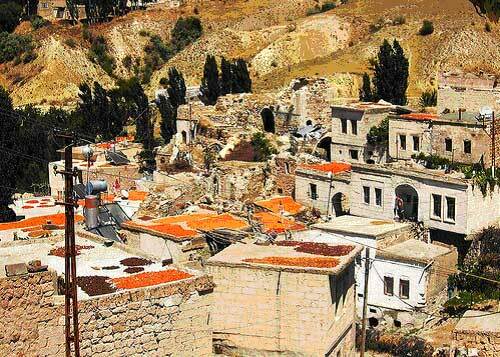 a narrow ravine opening slowly into a wider-bottomed, cultivated canyon) such as the Rose Valley and a church and history-packed one such as the marvellous Zelve (or Ihlara) to provide a suitable mix. But you should not miss a traverse on high ground, to get a panorama and an understanding of the weird topography, and we recommend that the area of Ak Tepe (The White Hill), the Goreme area's dominant landmark, as unmissable. The Ilhara Valley further away is also outstanding. 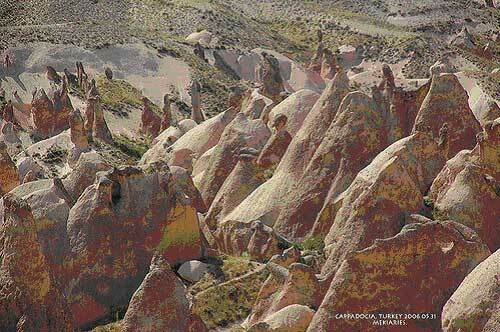 The Rose Valley, a fantastic ravine turning canyon which tumbles dramatically from Ak Tepe's southern shoulder. Zelve: this three-pronged canyon in the Ak Tepe massif is another open-air museum (so don't expect much solitude unless you penetrate deep into the valleys). Wander among ruined churches (from the C9 to C13) and houses in this one-time monastic retreat, beneath thrilling cliffs and unreal spires and formations. 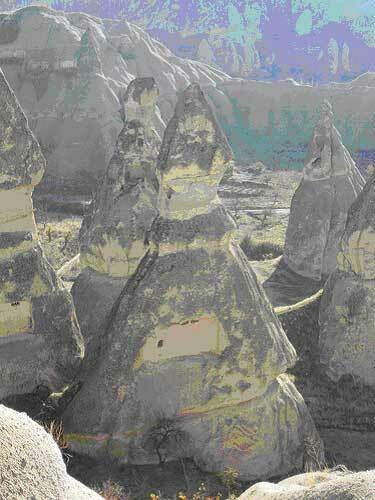 The Devrent Valley, further east beyond Zelve: extraordinary formations, thickly grouped. Some great wandering and imagining, but this is near the road, so don't expect to be alone. Swords and Love valleys, which are accessible from the Goreme Open-air Museum road, so easily combined with a museum visit. The track that winds above the southern cliffs of Zemi (Love) Valley is particularly rewarding, with its wide 'oramas over the countryside as well as views down into the valley itself. A marvellous little chapel (with ceiling paintings) carved into a single protrusion early on. 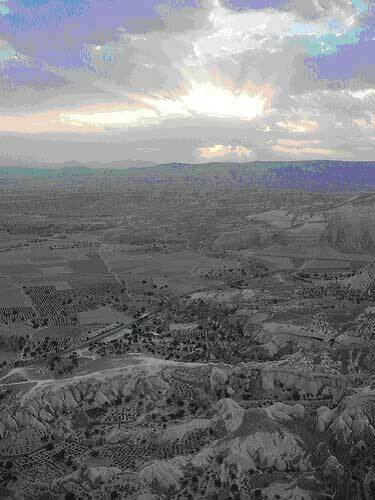 Pigeon Valley, between Goreme and Uchisar. The first proper ridge east of Goreme is a superb place, with particularly dramatic formations and some fascinating rock-houses. Easy walking and fabulous late afternoon light. Other valleys, of which we know little (anyone able to give info and photos???) include: 'Monastery Valley' to Tahtali Valley, near Mustafapasa, some 5 hours; From Gomede along the Uzengi and Pancarlik Valleys to Ortahisar; Balkanderesi and Zindanou Valleys. Ak Tepe (White Hill), a high mesa (table hill) near Goreme has superb atmosphere and views and should not be missed if you are in the area. The Ilhara Valley, some 50km south-west of Goreme, One of Cappadocia's finest valleys (a surprisingly green 16km canyon, really), which has it all - a mass of churches and a monastery hewn out of the huge cliffs-walls. 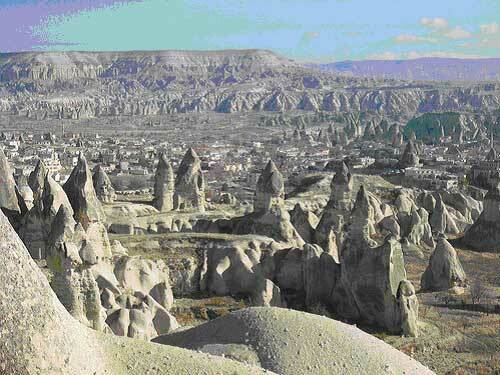 The pair of valleys at Soganli, south of Goreme. The magnificent ancient volcano of Hasan Dagli near Ilhara. The Ala Daglar National Park in the Taurus Mountains to the south, which has a superb selection of very different, high, demanding walks in remote limestone mountains. Goreme, the centre of the most spectacular scenery and thickest cluster of cultural treasures in what is now called the Goreme National Park, is a good base for exploration, and is home to the Goreme Open-Museum (see below). There are many expedition organisers, who will put together programmes of varied walking. If you have the time (and money!) 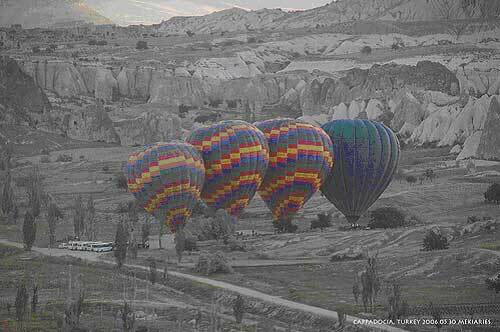 for a hot air balloon ride over the area, this is highly recommended.